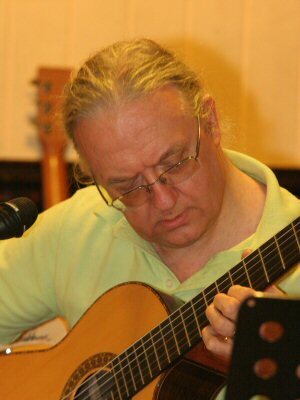 For three decades, I've been teaching Acoustic Guitar and Classical Guitar for all ages and abilities, along with Electric Bass and Electric Guitar for beginners. I am also an experienced GCSE level teacher and I have found that schools often attempt to teach music without learning to read traditional musical notation from the outset. I always base my lesson construction around teaching the guitar hand in hand with learning to read music, making me an ideal supplemental teacher as well as a high quality main teacher. All guitar lessons are on a strictly one to one basis. I don't believe in teaching in groups since players are often of different levels and learn at varying speeds. Group teaching simply doesn't give pupils their best chance for improvement. All lessons can take place either at my home, or yours, subject to arrangement. I'm based in South Manchester a few minutes from the Trafford Centre. I teach reading music as an essential tool for today's players. Some people learn to play from tabs, but that doesn't allow them to play music they don't know, because the rythm isn't designated.With music notation, given time the players can play anything that is put in front of them, and it's language is universal , and I can teach a 5 year old the rudiments of how you read music within the first hour. Playing the instrument however does take a little longer than that! I won't teach a particular style, which is too limiting for the student. Instead I will teach you how to be the best player you can be, with the aid of the best tutorial books around. Whether you want to play acoustic with a plectrum, or classical with your fingers/nails, I use books that go very gradually and thoroughly through the process. Its up to you to keep to your practice regime (which at the beginning is only 15 minutes a day) to enable you to reach your goal. I also actively encourage players to try to learn to play by ear too. To do this, you might play a CD and try playing along to it - maybe a rythm or a riff, whatever catches your imagination. It may be difficult at first, but you will begin to see the relationship between written notes and places on the fingerboard. After a while, you will hear a record, and find you know where the notes are on the fingerboard. Then you will see that reading music and playing by ear are inextricably linked, and your playing will take a big step forward. Lessons cost £13 for half an hour / £26 per hour, payable for 4 lessons in advance. There is an additional charge for teaching materials, please call or email for further details. You can also buy guitar lesson vouchers right now - Four Half Hour Lessons for £50 or Four One Hour Lessons for £100. Or why not buy our Web Only Special - 8 Hour of lessons for just £182 just use the buttons below and you'll receive your voucher in the post in a few days.